Dubai, UAE, May 13, 2018: Google announced on Sunday a new feature in its Search experience during Ramadan which brings information related to the month-long occasion to the main results page once users search using Ramadan-related keywords. Google also unveiled a new product that merges between virtual reality and calligraphy, as people around the world prepare to observe the holy month. Google users in different parts of the world will now be able to access all Ramadan related information right from the main Search results page by simply typing queries related to the holy month. The Search experience will house information like local prayer times, Ramadan tips, popular recipes on YouTube and links to Google’s main Ramadan services, the Qibla Finder and Qalam. Qalam (g.co/Qalam), a new web-application accessible through browsers which users can easily share with friends and family as their Ramadan and Eid greetings this year. Google worked with nine world-renowned artists and calligraphists to create over 35 artworks which merge between virtual reality art and calligraphy. Featured artists include the internationally renowned eL Seed whose designs incorporate calligraphy with graffiti (“calligraffiti”), Tolga Girgin from Turkey who mixes calligraphy and typography and Soraya Syed, one of the first female calligraphers in Pakistan. “As more than a billion people prepare for Ramadan, we too at Google have been working to help our users as they begin to adapt to the month-long occasion. This year, we’ve put together a few special experiences across Google to help people get the most out of the occasion, like bringing you the most relevant information right to your Search results or a new way to share Ramadan greetings that was made using virtual reality technology. 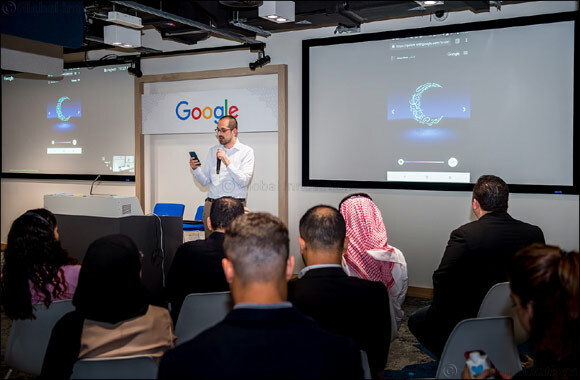 From augmented reality in Qibla Finder to virtual reality in Qalam, we brought Google’s innovation to your fingertips this Ramadan,” said Najeeb Jarrar, Marketing Manager at Google for the Middle East and North Africa. The third update Google announced enables offline usage of the Qibla Finder (g.co/QiblaFinder), a web app launched last year that uses augmented reality on Android devices to identify the direction of the Qibla. The update also allows Android users to add a shortcut to Qibla Finder on their home screen. These updates are reflective of digital habits during Ramadan. Google Trends data shows a spike in interest in “Qibla” and “Ramadan Kareem greetings” at the beginning and throughout the holy month. As for Search queries, internal Google data shows that the volume of queries conducted during Ramadan is higher than other monthly averages as people spend more time online.